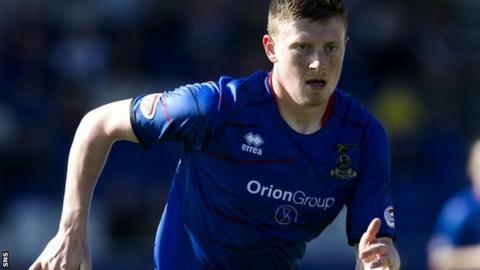 Inverness Caledonian Thistle forward Shane Sutherland could be out of action for some time through injury, fears manager Terry Butcher. Sutherland picked up a knee injury in Saturday's 1-1 draw with Aberdeen, having earlier won a penalty. "Shane will have a hospital scan on Tuesday on his right knee to assess the extent of the damage," Butcher told his club's website. "We keep losing key players and this looks like being another blow." Midfielder Nick Ross has been sidelined with a shoulder injury since the end of August and is expected to be sidelined for three months. And defender Chris Hogg has not yet returned to action after picking up a serious knee injury in December. The 21-year-old Sutherland has become a regular starter for Caley Thistle this season but came off the bench after 63 minutes against the Dons. It only took him two minutes to make an impact, with referee George Salmond awarding a penalty after the forward sped onto a pass played behind the visiting defence. Aberdeen have announced they will appeal against the red card shown to defender Russell Anderson for the challenge that prevented Sutherland from delivering a shot on goal. Richie Foran scored from the penalty spot, but the Dons equalised through Cammy Smith before Sutherland was stretchered off in stoppage time after appearing to twist his knee.